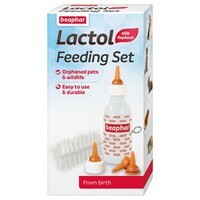 Beaphar Lactol Feeding Set is the essential milk feeding kit for all puppies, kittens and small animals. Containing a 35ml feeding bottle, 4 teats and a brush for cleaning, this Lactol Feeding Set has everything you need to nurture your pet. Specifically designed for feeding you puppies and kittens that have been orphaned, this vital kit will help to provide your pet with the best start in life!